Anyone who has never had the Arduino without any response to the programmer has not yet had enough experience! But do not panic (yet)! If the Arduino does not respond to the ISP programmer, the most used, then it may be time to try the HV mode. This list is in progress and by no means complete. Most devices that are pin-compatible with the ones shown here will work with no modification to the Rescue Shield software or hardware. If you have good results with a device that is not listed, please consider adding it. if you have tested a part not listed here, please consider adding it to the list! Note: Not all ATtiny parts have an EFUSE. If you try to read the EFUSE on a device that doesn't have one shown in the datasheet, it will most likely return 0xFF, and attempts to change it will not work (but could have unexpected results). The HV Rescue Shield is not a general purpose AVR microcontroller programmer. That is, it can't be used to perform a chip erase or program flash memory. It is intended only for programming the AVR's configuration fuses: HFUSE, LFUSE, and EFUSE (where applicable). The hardware implements all of the control lines to support flash programming, but the code just isn't there. If anyone would like to volunteer to rewrite the code to support more features, such as general flash programming, please post in the support forum! 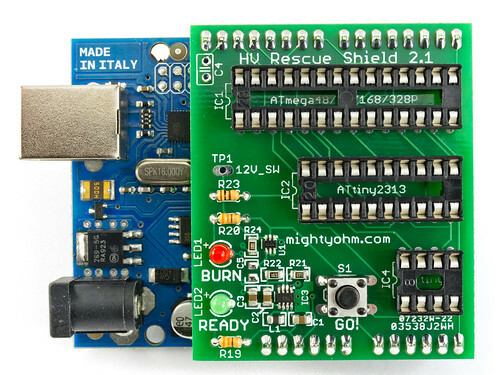 The HV Rescue Shield is 100% open source (hardware and software). OSHW rules! 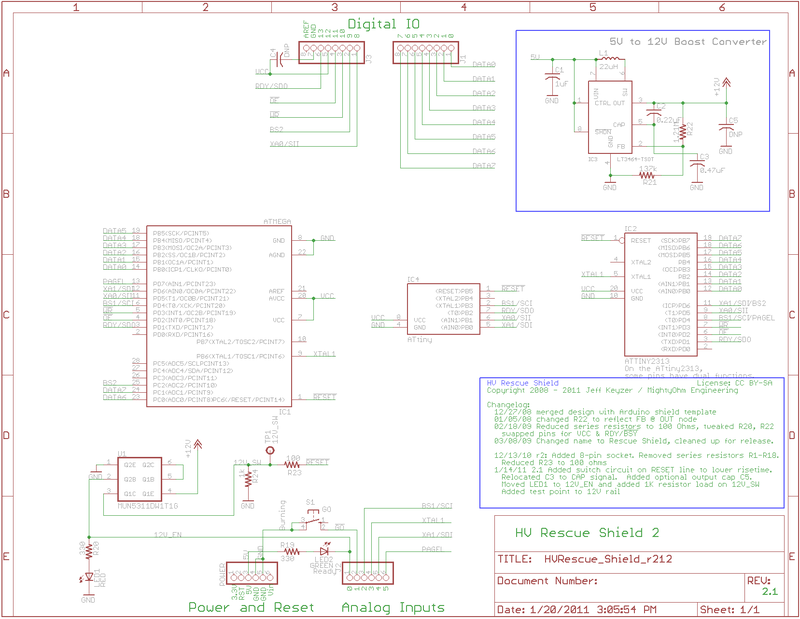 For assembly questions, troubleshooting and other support, go to the AVR Rescue Shield Forum.